The Henry Art Gallery and Bumbershoot have partnered to produce Nooks: If You Lived Here You'd Be Home by Now, by Instant Coffee. Join us in the nooks for very intimate concerts and art talks, readings and performances, dance parties, screenings, karaoke, and hands-on craft activities-all within a sculptural installation designed to be used as concentrated space for social interaction. Instant Coffee is an artist collective based in Toronto and Vancouver. The fluid collective's most consistent members are Jinhan Ko, Jenifer Papararo, Kate Monro, Jon Sasaki, Cecilia Berkovic, Emily Hogg and Kelly Lycan. 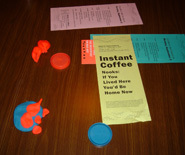 Instant Coffee recently exhibited in Peer Pleasure, Yerba Buena Center (San Francisco). Solo exhibitions include: Get Social or Get Lost, The Americas Society (New York); One is Not Enough, Or Gallery (Vancouver); and Year of Perfect Days, Sparwasser HQ (Berlin). Nooks: If You Lived Here You'd Be Home by Now is organized for the Henry by Associate Director for Communications and Outreach Betsey Brock and Associate Curator Sara Krajewski and co-presented by The Henry Art Gallery and Bumbershoot. Instant Coffee's project began in apartment 15 of 601 Bute Street in Vancouver, BC, in a seemingly ordinary kitchen nook with two benches and a table built into a recessed corner. This average nook serves pretty much the same purpose as a common kitchen table, as a place to eat, read the morning paper, chop vegetables, decorate a birthday cake or balance one's checkbook. 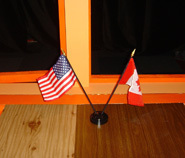 It is also a social place for cards, cocktails and conversation or a creative space for reading, writing and arithmetic, in cacophony or concentration. Over the past 10 years the nook at 601 served as a social and cultural center for a sprawling group of artists, writers, and musicians. In the way that a lively downtown is referred to as a 24-hour city, this was a 24-hour nook, comfortably accommodating morning coffee or nighttime drinking that can last till morning. Former nook holders, artists Hadley+Maxwell, raise a key nook issue. Even when they were home and working in separate rooms, going to the nook meant, "time to take a break and hang out with each other." While one can do all of the aforementioned tasks in the nook, and more - one cannot do them alone. By sitting in the nook, and taking the task, the do-er is saying, "I don't want to be alone." The furniture of the nook shouts "I have room for four! Maybe six!" Its form is invitational. 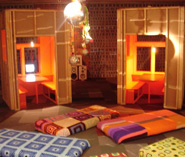 Instant Coffee's nook installations replicate and amplify the 601 nook's social power. These nooks, five in total that are exact in dimension to the original, create concentrated spaces for a great variety of social interaction from informal conversation to directed activities. The residue left behind from the variety of guided programs, events, activities, and performances that take place in the nooks, at the nook windows, and around them complete the sculptures. But it is the time in between where the nooks exhibit their true nature as a perfect space to be together. 4:00 Welcome from the curators and Instant Coffee artists Jenifer Papararo, Jinhan Ko, Kelly Lycan, and Khan Lee. 5:00 Helsinki Syndrome: This is not a test. Nooks: If You Lived Here You'd Be Home By Now was organized for the Henry Art Gallery by Associate Director for Communications and Outreach Betsey Brock and Associate Curator Sara Krajewski, with generous support from Bumbershoot, Patrons of the Henry Art Gallery, and special thanks to the Henry staff and volunteers.